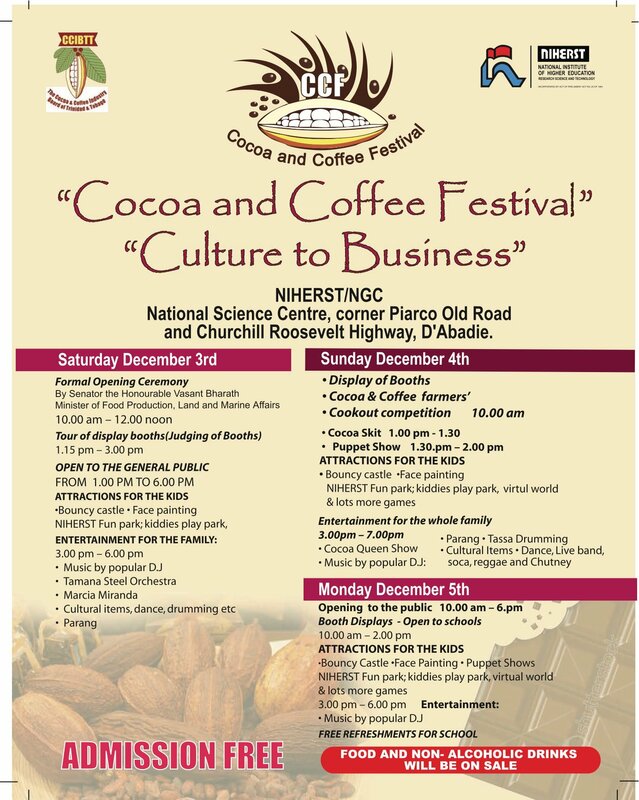 Two of our favourites culinary items – coffee and cocoa – are the stars of the show at the upcoming COCOA & COFFEE FESTIVAL, which will be held on Saturday, Sunday and Monday, Dec 3-5, 2011 at the National Science Center in Trinidad. Exhibitors will display and demonstrate their cocoa and coffee products on all three days. The Opening Ceremony is on Saturday, December 3rd at 10am in the Techkno Theatre with a feature address by the Honourable Vasant Bharath, Minister of Food Production, Land and Marine Affairs. On Sunday (December 5) at 10am, a cooking competition that showcases cocoa and coffee will be held. Food and beverages will be available for purchase each day. In addition, there will be a bouncy castle, face painting, NIHERST fun park and kiddies play park for children. Day 1 (evening) – Parade of Cocoa Queens, presenting the cocoa history of their area and a talent option (song, dance, drama etc). Day 2 – Dancing the cocoa competition and UTT Dance Troupe. Day 3 – Lopinot Parang Group, Performance by Scrunter and Lord Relator and Crowning of the Cocoa Queen. FYI – Monday is the day that hundreds of school students will attend the festival. Tags: Tobago Chocolate, Trinidad Chocolate, Trinidad Coffee. Bookmark the permalink.